Out of all major sectors in the United States, the construction industry has consistently been ranked at the top for fatal injuries. In 2016 alone, OSHA recorded 4,683 workplace fatalities with 991 of them coming from construction or roughly 21% of the total. Of these 991 fatalities, 63.7% of them can be attributed to one of four major accidents, the “Fatal Four:” Falls, Struck by Object, Electrocutions, and Caught-in/between objects. With the heavy machinery, heavy traffic, and sometimes irregular work environment, these four accidents can be incredibly difficult to account for most of the time. However, modular construction presents a solution to these accidents by completely overhauling the construction process. In this post, we will examine how modular construction can help with these 4 main injuries and others, offering an overall safer environment to build. First and foremost, the ability to clearly and accurately communicate current and future hazards is much easier when using modular construction. On a construction site, work can often be chaotic. Moving from job site to job site, new work processes are created for every job and can sometimes even change from week to week depending on what work needs to be done. This unfamiliarity with work processes creates inefficiencies and flaws with materials and equipment. So, in these cases, workers can end up finding heaving machinery and building materials in places that they do not expect which leads to accidents. At a construction job site, modular construction can help fix this problem in one major way. Rather than having 100 different moving pieces on a job site, a pre-assembled building gives the workers one big object to fixate on. This one big structure allows the construction workers to coordinate and centralize their focus to one main area. When looking at the “Fatal Four” of the construction industry, improved hazard communication can help solve “Struck by Object” and “Caught In/Between” fatalities by reducing the amount of simultaneous activity at a job site and increasing the mindfulness of a potential hazard. Improving site safety does not amount to much if the modular construction environment is unsafe as well… Thankfully this is not the case. Because unlike a traditional stick-built construction process, the majority of modular construction takes place in a factory-like, assembly line environment. 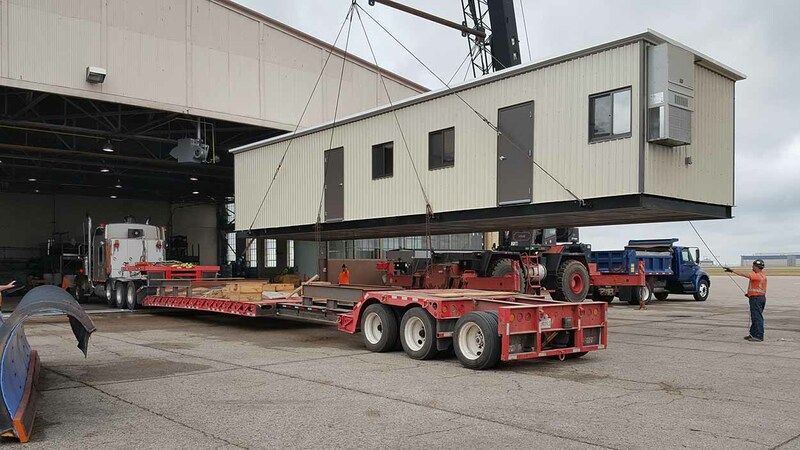 The modular construction process itself sets up standardized workflows that encourage specialization and a full understanding of your duties and surroundings, allowing for far fewer accidents to occur in comparison to a typical construction site. The factory will be sectioned off into individual work zones, each providing added value to the structure. Workers assembling the building specialize in a specific task pertaining to the building. Due to this specialization and highly controlled work environment, offsite construction results in far fewer errors in quality and personal injury. In fact, according to “Safety Management in the Construction industry SmartMarket Report,” 73% of modular construction users have a fully inclusive safety program in place in their facilities, in comparison to the 48% of their non-modularized counterparts. When looking at these two construction types in terms of OSHA’s “Fatal Four” construction accidents, it is easy to see where modular construction excels. To start, falling from a structure is an issue that is not typically incurred in modular construction’s production phase. All fabrication and panel assembly occurs on the shop floor. Although falls can still occur from shorter distances, these are far less dangerous. In the installation phase of the modular construction process, installers will sometimes have to go to heights of 8’ to 10’ feet for our single-story buildings and structures. For our two-story offices and tower systems, the heights of the structures can be much higher ranging from 20’ to 80’ feet in the air. However, there are still safety advantages to modular construction’s design. For the two-story system, the structure will have no sloped roof, making the installation much safer for the workers. In the case of our prefabricated tower systems, the modular structure has already been 90% fabricated, leaving the module to simply be installed on the top of the structure using a crane to hoist it up. In both cases, the installer/worker in the modular construction scenario will be spending far less time at these dangerous heights, making the job inherently safer. With the majority of the modular construction process taking place away from the job site, there is a significant reduction of overall foot traffic on site. The work hours that would typically occur in a condensed area is now taking place in a manufacturing facility, providing more space to work. This can help reduce the number of “struck by an object” accidents, the second most common construction accident. Struck by object accidents accounted for nearly 10% of all construction fatalities in 2016. The main protection against these incidents is to stay mindful of operating machinery and being aware of job site surroundings. Additionally, a reduction in the number of workers at a job site reduces the chances of the number four leading fatal accident, “Caught-In or -Between Hazards,” about 7% of the overall total. Overall, modular construction’s safety has a variety of benefits to offer to both employers and employees. Companies can save on worker’s compensation payouts, and employees have the peace of mind that accompanies a safer work environment. Employee safety is always a serious matter that should be pushed as a top priority for any workplace. The overall number of fatalities has been on a downward trend over the past 10 years, but in order to keep this trend going, new measures must be taken in order to minimize this risk. We also manufacture a wide range of specialty safety structures. In addition to the construction industry, warehousing has its own safety risks associated with it. “In 2015, the transportation and warehousing industries had the second highest rate of injury per 100 full-time employees, and workers in these industries saw the most days away from work due to these injuries. 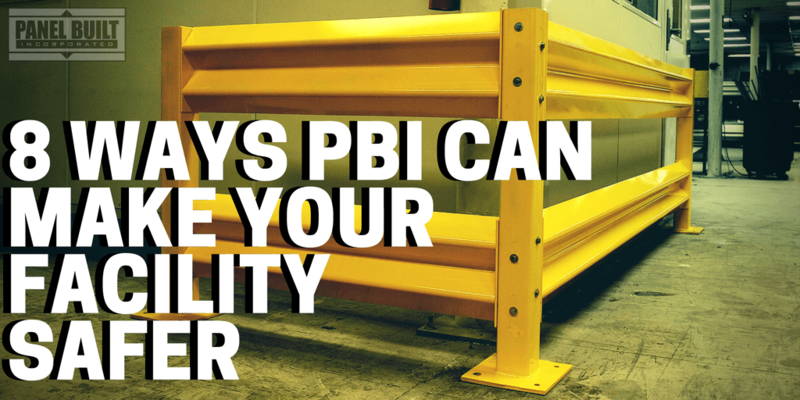 Manufacturing was tied with construction with the fourth highest rate of injury.” Check out our post “8 Ways Panel Built Can Make Your Facility Safer” to learn more! If you’re in need of a modular structure or would like to utilize modular construction as a part of your next construction job, contact us at info@panelbuilt.com or give us a call at 800.636.3873. We would love to help you with your project.